This report addresses bacterial adaptability and survival in contact with antimicrobial biocides that are widely used in e.g. hospitals and food productions. Two prevalent and pathogenic bacteria were used as model organisms; Staphylococcus aureus and Listeria monocytogenes. The biocides used were hydrogen peroxide (H2O2), benzalkonium chloride (BZK) and silver nanoparticles (Ag-NP). 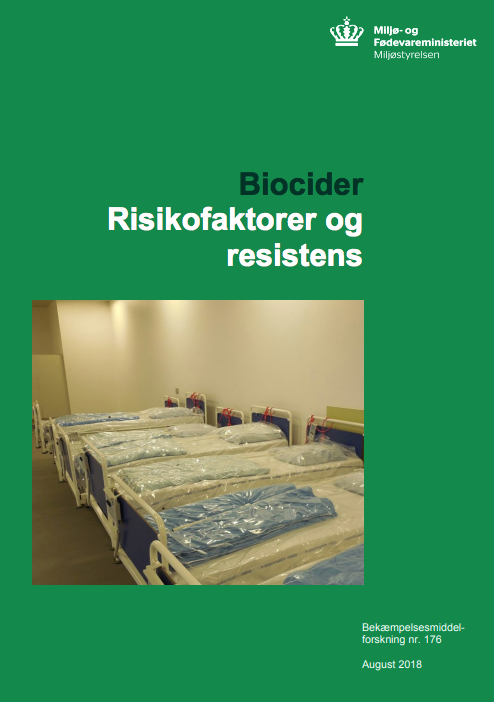 Additionally, studies of equipment disinfection on a Danish hospital were performed, as the prevalence of Staphylococcus spp. was measured before and after washing and disinfection of hospital equipment such as beds, cots and wheelchairs. The objectives of the project were in part to evaluate changes in bacteria after prolonged exposure to non-lethal concentrations of biocides. These changes were evaluated as growth inhibitory concentrations of biocides (MIC), changes in antibiotic resistance as well as changes in the expression of key virulence factors in the bacteria. Another objective was to describe and make models of the risk of resistance development and –spread among bacteria (Staphylococcus) in a hospital that uses BZK for disinfection. DOWNLOAD THE FULL REPORT FROM mst.dk (in Danish). Summary available in English at page 9.